Who doesn't like a little home town scare? This one will get you, if you're not paying attention. There's a new viral site for Scott Derrickson & Massawyrm's new film Sinister, which hits theaters this weekend, and it's rather creepy. The site makes a link to send to friends that opens a "news" article about a "Sinister Killing", with re-used text saying that "4 dismembered bodies were found in the backyard of a residential home" and so on. 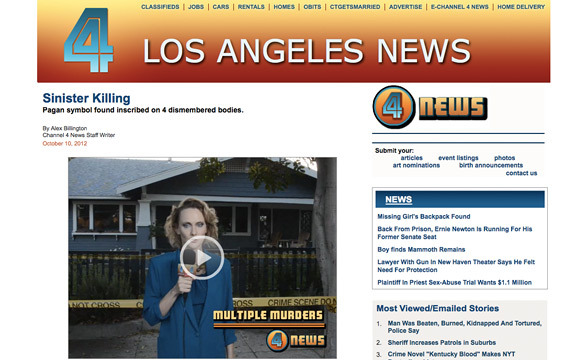 It's rather gruesome, but you can tell it's a bit creepy, cause even the news lady looks eerie. It's a freaky viral, but most of all a reminder that Sinister hits theaters this week if you're in the mood for horror. Click below to view the article I made, and you can create your own local one to send out. Use with caution! If you haven't seen the latest red band trailer for Sinister, it's worth watching here. Read Jeremy's review. The site generates a link to a fake newspage where one of the headlines is from today's actual news "Missing Girls Backpack Found" that links to the movie's page on Rotten Tomatoes. Classy. i'll be seeing the movie - but this didn't disturb me at all. the last thing that gave me chills was the trailer for "mama".....THAT freaked me out. was there something I was supposed to see?